By 2020, for the first time in history, the number of older people will outnumber the number of children younger than 5 years of age. In the next 25 years, the number of people older than 65 will double. And the average life expectancy is expected to rise to 110 by 2030. This mega trend is adversely impacting our country and the need for In-Home Care services will continue to climb. Is Your Organization Looking to Build or Strengthen a Personal Care Program? Many home care organizations are looking at developing Personal Care Programms to add to their service mix. The aging of America let alone the aging of the world is driving the need and growth for In-Home personal care. Often called non-medical or private duty, personal care services help individuals remain safe, independent and engaged in leading enriched lives. It’s often the kind of in-home help that allows people to avoid moving out of their homes into a more expensive and less attractive setting. Hospice Advisors is an authority in helping organizations start, manage and grow this type of business. Are You Looking to Refine and Improve an Existing Program? The biggest challenge in implementing a Personal Care Program is managing the recruitment and training of quality caregivers and having a referral development plan to acquire clients. Learn from Hospice Advisors how to build a $3.0 MM personal care company. Hospice Advisors helps you answer the following questions to determine if a Personal Care Program is the right strategic move for you. Depending what the answers are, we can help you develop and execute a program model. What is the primary objective(s) for implementing a Personal Care Program? Do you “Buy” or “Build” There are several excellent Franchise Models that are excellent turn-key operations. Do you currently offer any personal care services? If you have a Personal Care Program in place, how could the program be improved? If you have Personal; Care Program in place, is it performing well and financially sound? Does the organization have any of the needed elements to form a Personal Care Program? Following are a few examples of Personal Care Programs that Hospice Advisors has worked with. Homewatch CareGivers is an outstanding Franchise Model and is a leader in the industry. Here is an operation that is located in southeast Michigan. Hospice Advisors has help set up several from “scratch”. This Personal Care Company was set-up in Moscow Russia. If you would like to explore how we can help you with a Personal Care strategy or to schedule a free, confidential, no obligation consultation, please EMAIL US or call 734-658-6162. Kurt Kazanowski, managing partner of Hospice Advisors, is an authority in personal care home health program development. With over 10-years of operating and business development experience in this space, he is considered an industry insider. 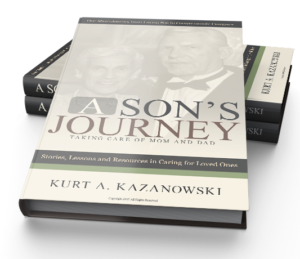 In 2015 Kurt wrote and published “A Son’s Journey; Taking Care of Mom and Dad”. A poignant story about the daily challenges of caring for aging parents and the transformation from loving son to primary. caregiver. The book is considered a must read for all adult children facing the challenges of caring for aging parents. Lessons of of inspiration, courage, hope and joy. A Son’s Journey is the essential resource guide for the adult child. For more information or to purchase the book, visit www.asonsjourney.com.